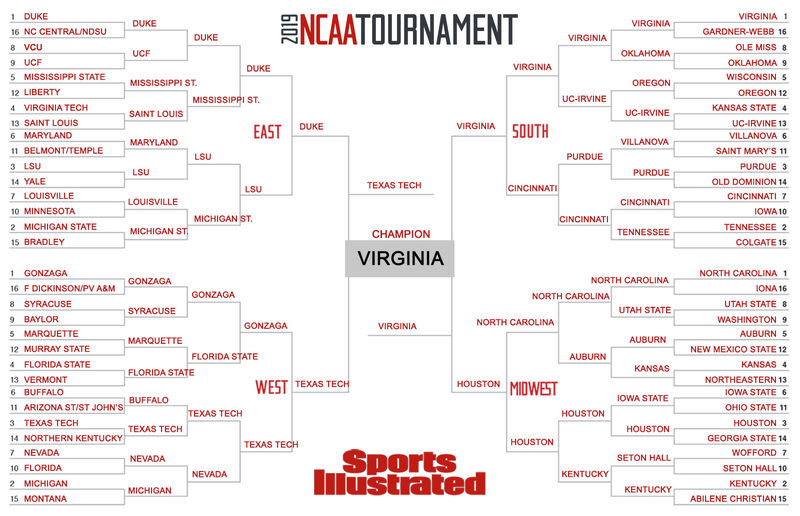 Who do our writers and editors think will win it all? We've locked in our picks for every game of the 2019 NCAA tournament. The 2019 NCAA tournament bracket has been released, the First Four has come and gone, and now that the snubs have been mourned, the initial thrill of analyzing the field of 68 has worn off and your various March Madness pools have been organized, it’s time to lock in your picks before the games truly begin. As time winds down until the action begins in earnest, there’s only so research you can cram in before you have to put your money where your mouth is. To help you make the tough decisions that come with filling out a March Madness bracket, a panel of Sports Illustrated writers and editors has made its picks for every game. Four specific explanations of some of our more surprising upset picks, check out our roundtable on this year’s most fearless predictions.